This app has been very popular with my three-year-old. 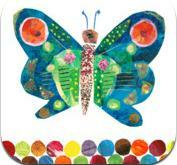 Eric Carle illustrations and textures are used to create memory and matching games with varying difficulty levels. It comes with two sets of illustrations: colors and animal homes. Additional sets (shapes, numbers, food, and animals sounds) can be purchased for $.99 each, but are definitely not necessary. In the Easy level, the child swipes to move colors or pictures, and matches the picture with its dominant color, or the animal with its home. Medium level is a standard, flip-the-cards memory matching game. The Hard level combines the two; using memory card-style of play to match a color and picture, or animal and home. The illustrations will be familiar to Eric Carle fans, and the app has a nice, clean design. My son goes back to it again and again without getting bored, so I haven’t found it necessary to add more sets to play. If your child is a fan of Eric Carle books, this app is a good complement and a solid addition to your app library. Posted on July 2, 2012, in Apps and tagged Eric Carle, iPad, iPhone. Bookmark the permalink. Leave a comment.